Jacques Peretti investigates consumerism. In this episode, Jacques looks at the marketing strategies for selling to children and the how they are being applied to adults. Jacques Peretti reveals how the lessons learned from selling to children were used to make childlike consumers of us all. Jacques visits US behavioural researchers who use their skills to help companies market to children, as he explores the history behind marketing to the very young - something which took off in the 70s and was followed by a turbo-charged decade of commercial children's entertainment, with whole TV series constructed around toy merchandising. He challenges a Nickelodeon executive who brought American-style children's TV to the UK and also meets the car designer who targeted his product not at the adult consumer but at the children in the back seat. Today, the rules learned from selling to children have been applied to us all. 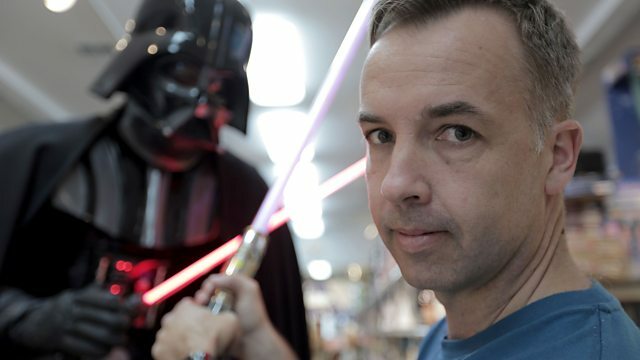 Jacques meets the adult gamers at Comicon and explores the rise of 'gaming' for adults. Game designers are all in search of 'stickiness' - the way to keep us coming back for more. Jacques meets those who created one of the 'stickiest' games of all time, Neopets, and discovers how 'gamification' has been used as a strategy by some of the biggest corporate names, such as McDonald's. The programme also explores how spending itself has become a 'game' - an endlessly repeatable behaviour, enabled through credit and the ease of one-click shopping. With the glamourisation of 'shopaholism', we are left not only wanting to spend, but seduced because it is easier than ever to do so.